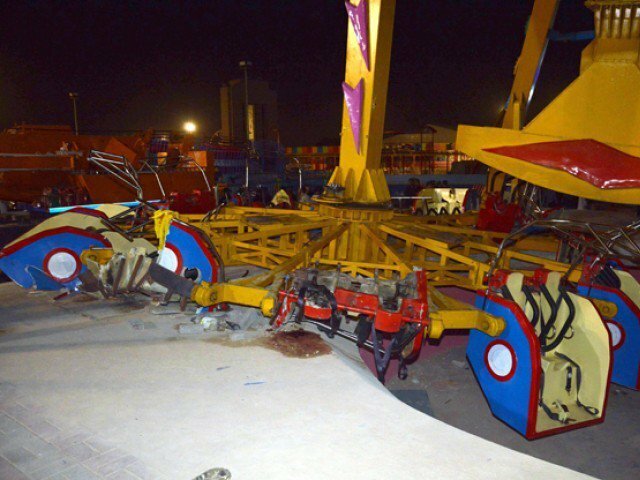 Karachi: A young girl died while several injured due to the ride collapse at Askari Park. The 16 seater ride came on ground in Askari Park. However, it resulted in the death of one girl and injuries of 16 people. According to eye witnesses, they heard a loud explosion in the ride’s mechanism before it fell down on the ground. The ride was opened for a trial yesterday but closed after the unfortunate accident. In addition, police also shut down Askari Park for public. Saleh Farooqui, Commissioner Karachi said that the park will remain closed till the full technical checkup. Chief Secretary for Sindh, Major (retd) Azam Suleman Khan, ordered to shut down all amusement parks in Sindh untill the completion of full technical inspection. He also formed the committee led by Deputy Commissioner for Karachi’s East District that will submit the report in next 24 hours. Pakistan Tehreek-e-Insaf’s (PTI) leader Dr Arif Alvi said that he visited the Jinnah Hospital after the incident. He said that one child is died and one person is in critical condition. Singer Fakhr-e-Alam said that it is not the first incident. He further added that the Askari Park management and authority is responsible for using old rides and the unfortunate incident. This is not the 1st incident that happened at the Askari amusement park. An 8 year old girl has died because park owners have old rides that will not be allowed to operate in ither countries. Not only should the park management be held responsible but also the park authority. PML-N Leader Miftah Ismail showed her condolence with died girl’s family. He said that he is saddened after the news. Saddened to hear about the accident at Askari Amusement Park in old Sabzi Mandi, Karachi, which took the life of one little girl. My heartfelt condolences to her. family. May Allah protect Pakistan and Pakistanis everywhere. Pakistan Peoples Party (PPP) leader Naz Baloch also showed her condolence. She further added that strict safety rules should be implemented in al amusement parks.